Say hello to the first P2P live streaming app for Apple TV. The New Hampshire primaries are over and now we know who the big winner was. No, we’re not talking about Sanders or Trump, but BitTorrent Inc, the company that focuses on ways to use the BitTorrent protocol beyond simple file sharing. 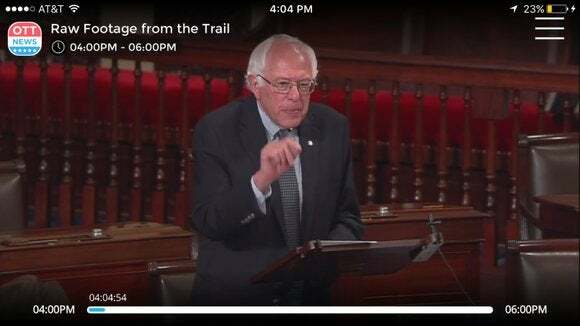 BitTorrent partnered with the burgeoning independent news organization OTT News to bring live, torrent-based video streaming coverage of the latest presidential primary to Apple TV, Android, and iOS, and it was thanks to technology that's been in the works for years now. Why this matters: During the New Hampshire primary OTT’s streaming was powered by BitTorrent Live, a project that BitTorrent (the company) has developed in various incarnations in recent years. BitTorrent Live, built by the original BitTorrent creator Bram Cohen, is a peer-to-peer networking protocol designed for the demands of live video streaming. In 2013, BitTorrent Inc. rolled out BT Live as a web app before cancelling it in 2014 to focus on mobile. OTT News is one of the earliest mobile apps to use BitTorrent Live, but BitTorrent Inc. says there will be more to come. In its blog post announcing BitTorrent Live’s use by OTT, the company said it will make a streaming platform available for other live streaming events later in 2016. For now, you can check out OTT News’ BitTorrent-powered work as it intends to cover other upcoming events during the race to the presidency, including unnamed “key primaries,” the political conventions, election night, and the inauguration next January.